For centuries, pumpkins and gourds (and even turnips) have been carved into grotesque faces and used as lanterns. There are many different explanations as to why this unusual tradition was started: some believe they represented supernatural beings or souls in purgatory, others think they warded off evil spirits, or conversely, were used to guide good spirits to their homes. Whatever the original reason, pumpkin carving is still a fun way to mark Halloween and bring some atmospheric lighting into the home. While ghoulish faces look splendidly spooky on the day itself, we love to make the most of the hollowed-out shells throughout the season (especially as it gives us an excuse to make delicious soup with the innards). 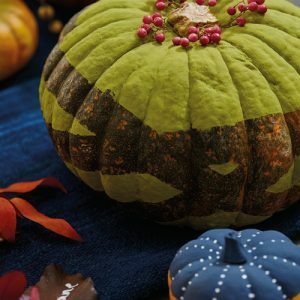 Take inspiration from our unique pumpkin carving ideas if you want something a little more grown up to have on display throughout the season. We love to have painted pumpkins on display as a seasonal ornament. Using masking tape as a stencil, plan where you want to paint or spray, and where you would like the pumpkin’s natural colour to show through. Paint or spray areas of the pumpkin that you wish to cover, then leave to dry fully before removing the masking tape. Top with berries or foliage of your choice. This simple way of carving pumpkins makes beautiful table decorations, the perfect centrepiece for an autumnal dinner party or to add a chic and cosy touch to your home throughout the season. Carefully cut a circular cap out of the top of your pumpkin with a knife. 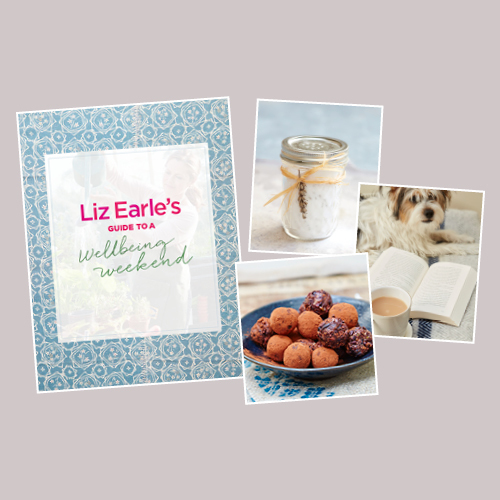 Scoop out the contents with a spoon and mark where you want holes with a chalk pencil. 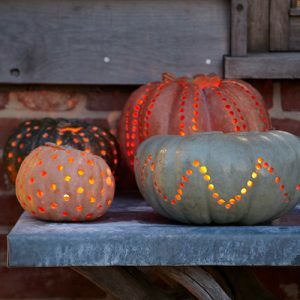 Using an electric drill make holes in the pumpkin, following your own design and changing the drill bit size appropriately. 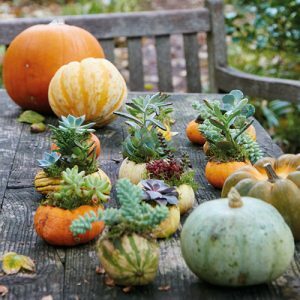 These are a truly unique way to use up small gourds with on-trend succulents. Using a knife and spoon, hollow out the gourds. Pack out the hollowed-out shells with moss and one or two small succulents. Place the gourds on saucers if they’re going to sit on a surface for an extended period, as they may leave a stain as they age. Our gourds lasted a few days and the succulents went on to find a permanent new home in a terrarium. A simply beautiful way to display flowers, we used dahlias straight out of the garden. Cut a reasonable-sized cap out of the top of the pumpkin with a knife, then hollow out the innards using a spoon. Place a jar or vase filled with water inside the now empty pumpkin. 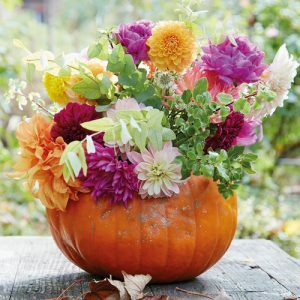 Fill with flowers of your choice, then place the pumpkin on a plate if it is going to remain in the same spot, to avoid staining the surface below.